The end result was all right. The edges got a little too crispy for me, and because of the amount of olive oil the crust was baking in, the olive oil taste was also a little too much. My mom liked it… but she likes just about everything I’ve cooked or baked for her :). However, pizza is pizza, and it wasn’t bad – I just need to make it again – successfully! I liked using the drained crushed tomatoes as the sauce. I was a bit surprised to find that crushed tomatoes look like a thick tomato sauce – I was expecting them to look more along the lines of diced tomatoes. At any rate, it was overall a decent pizza, but not awesome – IMHO. 2. Place towel or shelf liner beneath stand mixer to prevent wobbling. 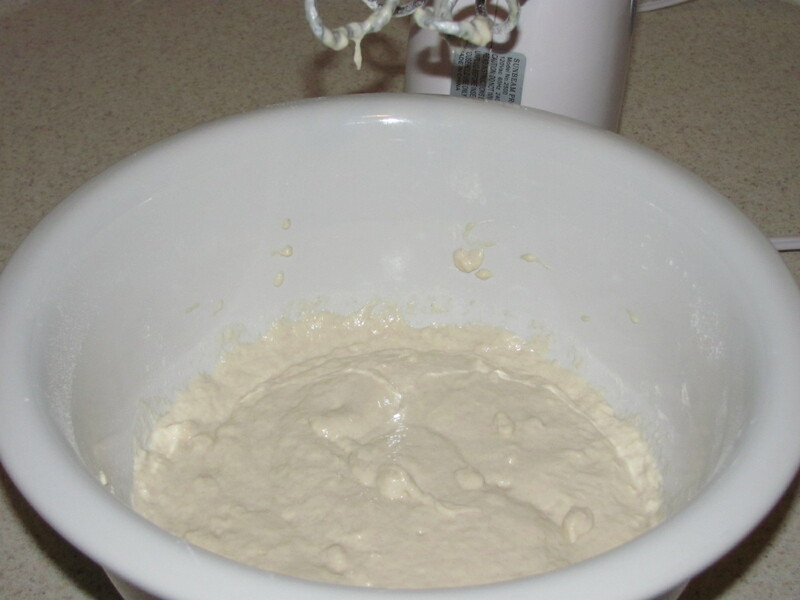 Mix flour, water, and table salt in bowl of stand mixer fitted with dough hook on low speed until no patches of dry flour remain, 3 to 4 minutes, occasionally scraping sides and bottom of bowl. Turn off mixer and let dough rest 20 minutes. 4. Using fingers, coat large bowl with 1 tablespoon oil, rubbing excess oil from fingers onto blade of rubber spatula. Using oiled spatula, transfer dough to bowl and pour 1 tablespoon oil over top. Flip dough over once so it is well coated with oil; cover tightly with plastic wrap. Let dough rise at room temperature until nearly tripled in volume and large bubbles have formed, 2 to 2 1/2 hours. 5. One hour before baking pizza, adjust oven rack to middle position, place pizza stone on rack, and heat oven to 450 degrees. 6. Coat rimmed baking sheet with 2 tablespoons oil. Using rubber spatula, turn dough out onto baking sheet along with any oil in bowl. Using fingertips, press dough out toward edges of pan, taking care not to tear it. (Dough will not fit snugly into corners. If dough resists stretching, let it relax for 5 to 10 minutes before trying to stretch again.) Let dough rest in pan until slightly bubbly, 5 to 10 minutes. Using dinner fork, poke surface of dough 30 to 40 times and sprinkle with kosher salt. 7. Bake until spotty brown, 15 to 17 minutes, rotating baking sheet halfway through baking. Using metal spatula, remove pizza from oven, spread tomato mixture evenly over surface, and sprinkle with shredded mozzarella. 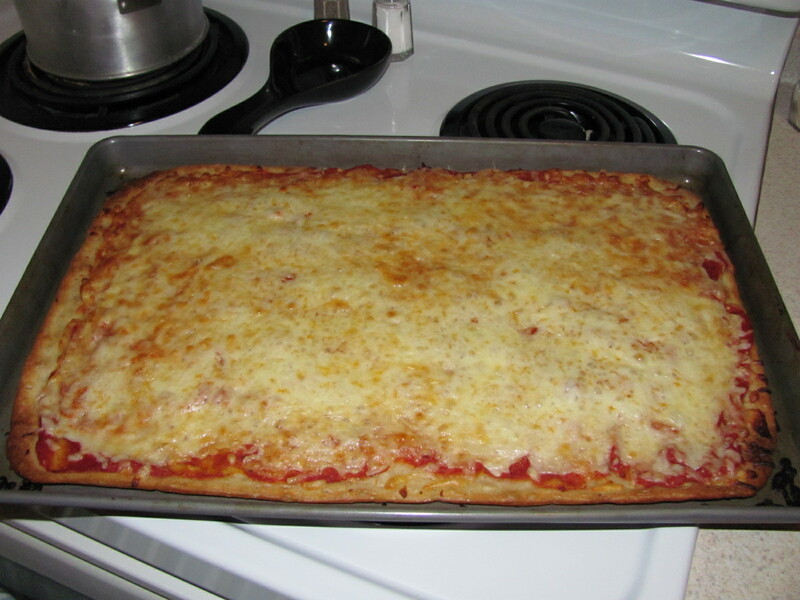 Return pizza to oven and continue to bake until cheese begins to brown in spots, 5 to 10 minutes longer.